Operations Manager and SRT member Alf Evans (middle left) with beneficiaries, DPRK, January 2013. 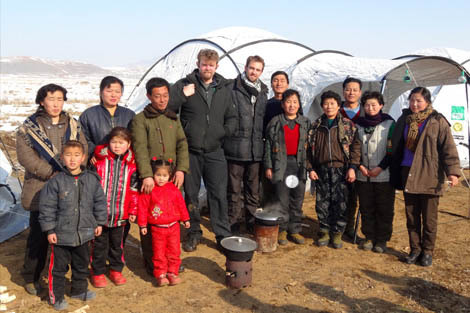 Shanghai Rotarian Randal Eastman assisted ShelterBox in helping homeless typhoon survivors in the Democratic People’s Republic of Korea (DPRK), who have been living in winterised ShelterBox tents throughout the harsh winter, protecting them against the extreme subzero temperatures. In August 2012, Typhoon Bolaven caused downpours to sweep across east and west coastal areas of the East Asian country leaving around 51,600 hectares of land flooded, buried or washed away; 26,320 people displaced; 50 missing; and 59 dead. This further exacerbated damage caused earlier in the year by a similar storm. Randal is a past president of the Rotary club of Shanghai in China and also part of the Korean Friendship Network, a non-for-profit network that has been supporting humanitarian projects through Rotary and Rotaract for over a decade. Through his contact with the Korea Committee for the Promotion of International Trade (KOMT), ShelterBox was able to send winterised emergency shelter and lifesaving supplies to North Korea where KOMT distributed it to the most vulnerable families in need.